Medfield Animal Shelter News: Donations! 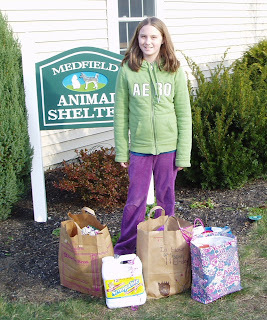 Sarah McLafferty asked her friends for donations to the Medfield Animal Shelter instead of gifts for her recent 11th birthday. She looked at our wish list so she knew what we needed which means we are already putting many of the donated items to good use. She also brought some very fun cat toys that she tested out on a few of the cats currently at the shelter. Sarah and her family came by today with the donations and was kind enough to brave the bitter cold to pose by the sign. Thank you, Sarah! Great idea. A very caring child. Thanks for posting the story. What a great idea - and a wonderful child . .